From wide expanses of sand to secluded beaches. 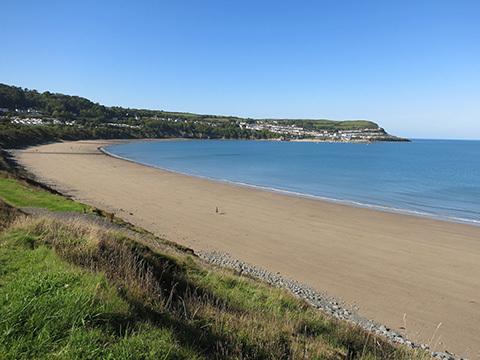 Ceredigion is renowned for its excellent sandy beaches, many of which carry the prestigious Blue Flag Award. Many of the beaches are uncommercial but you can usually find fish and chips and ice cream to enhance your day. Our children were fortunate enough to have their holidays here at Brownhill and now the grandchildren are able to repeat the experience….. 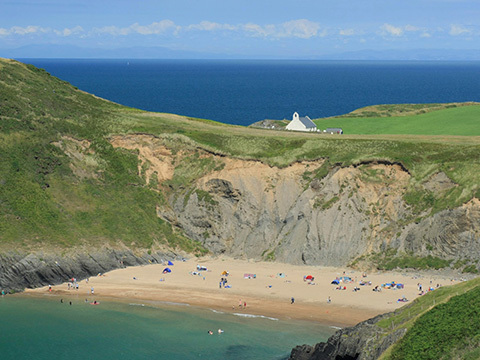 Owned by the National Trust, Mwnt is a lovely secluded beach which can get busy in peak season. The steep steps down to the beach make access a little difficult so this beach is not for everyone. The refreshment kiosk at the top is accessible by all however and affords some fine views over the beach. 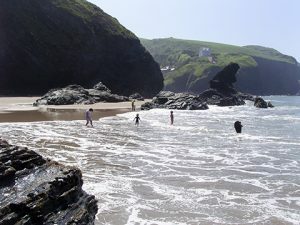 Tresaith is a great beach for adventuring at low tide as access to other beaches and waterfalls opens up with the receding waters. Best to park at the top of the village and walk down the many steps to the pub, café, shop and conveniences by the beach. 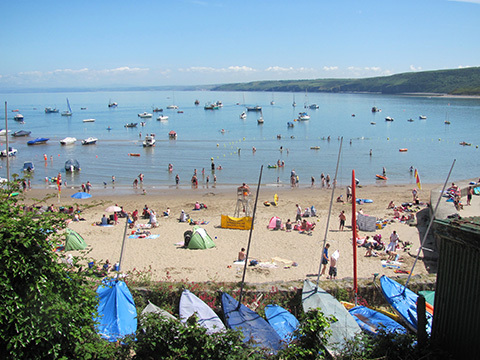 Another of Ceredigion’s Blue Flag beaches, the beach is popular with families throughout the summer. Llangrannog must be one of the most photographed beaches on this coastline with the small village nestled in the hills surrounding the sandy beach. It affords safe swimming with the lifeguard providing a watchful eye throughout the summer. Pubs and cafés, as well as some delicious ice cream, offer the visitor opportunities to extend their stay here. The town is a bit of a car bottleneck so you are advised to use the free parking at the top of the village which is serviced by a shuttle bus in the summer months. Traethgwyn is a lovely long stretch of sandy beach just outside New Quay. As one of the few beaches which does not have restricted dog access in the summer months, it is a favourite walking spot and there is a wonderful feeling of satisfaction to walk the length of the beach and back. 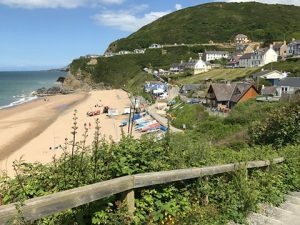 Charlie’s Field, owned by Brownhill Holiday Park, is situated above this beach and is an ideal place to park your car for instant beach access which is available to all our guests. It is also a top spot for a tented wedding venue so please get in touch if you would like more details.